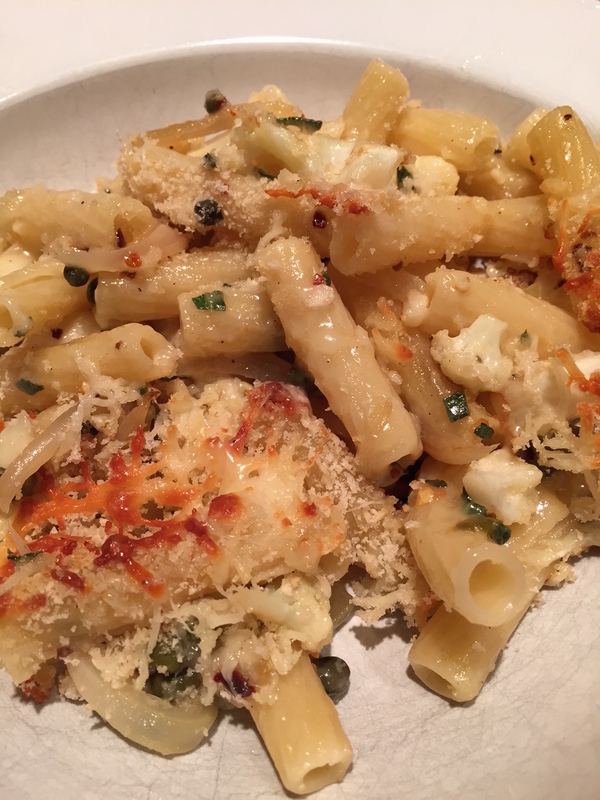 Or Penne e Cavolfiore al forno – this is my version. When I am home on Mondays, we have “Meatless Monday” as a way to eat more vegetables and less animal protein. I spent weeks researching and testing this recipe – it’s a reverse-engineer of one of our favorite restaurant dishes. Cook the penne in well-salted water according until al dente. For example, if directions call for 12 minutes cooking, cook for 10 instead. Rinse pasta with cool water, then drain again and set aside. Put 3 tablespoons olive oil in a wide skillet over high heat. Add cauliflower slices, along with any crumbly pieces, in one layer. You may need to work in batches if necessary. Let cauliflower brown and caramelize for about 2 minutes, then turn pieces over to brown the other side. Cook for another 2 minutes, or until the cauliflower is easily pierced with a fork. Season generously with salt and pepper. Add capers, garlic, red pepper flakes, chopped sage, and lemon zest and stir to coat. Put cooked cauliflower mixture in a large mixing bowl. Add cooked penne and fontina and toss. Transfer mixture to a lightly oiled baking dish. 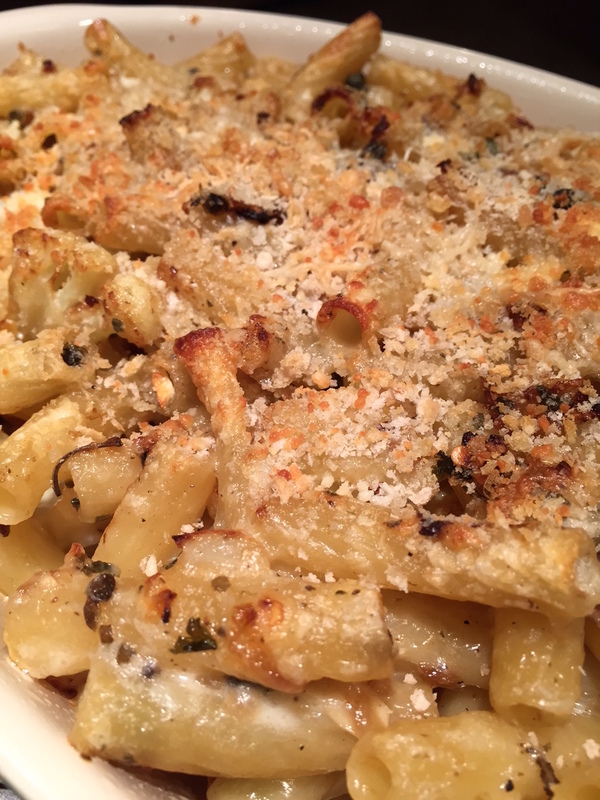 Top with pecorino cheese, then with bread crumbs and drizzle with about 1 tablespoon olive oil. Hints: 1) Use salt & pepper liberally in this dish. 2) Sometimes fontina or mozzarella is not an easy cheese to work with. I put my block of cheese in the freezer before grating. Thank you – Please try it, I would be interested in what you think!